Tis’ the season for dry, sad, and brittle hair. Sure, the temps are finally warming up, but your hair may still be suffering from the wrath of winter. In order to have soft, luscious, and healthy hair this spring, give your mane some TLC. This stuff is a-m-a-z-i-n-g — no joke. My hair didn’t feel dried out after using the shampoo, and the conditioner is ultra thick. I also felt the conditioner helped with the knots and snarls. My only complaint with this duo is the smell. The scent is really strong! If you’re a fan of MoroccanOil products, then you’ll love this duo. 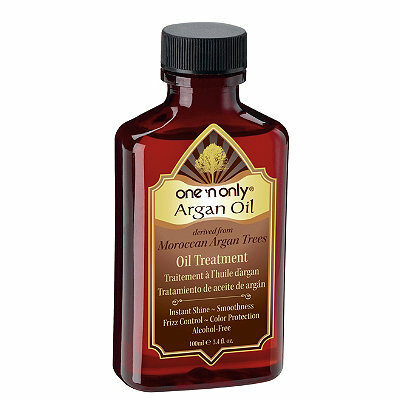 I’ve tried many MoroccanOil copycats over the years, and this is the first drugstore brand that really nailed it. It even smells the same! Did I mention it’s $18 less than the luxury brand? Score! This is the other MoroccanOil copycat that I love. It works great! 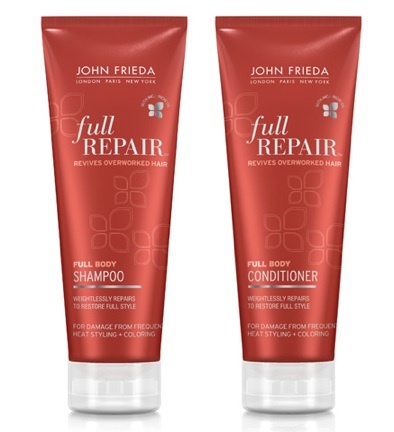 Apply it to your mid-shaft and ends right before blow-drying for frizz-free hair. Find it online or at your local Ulta for $11.99. 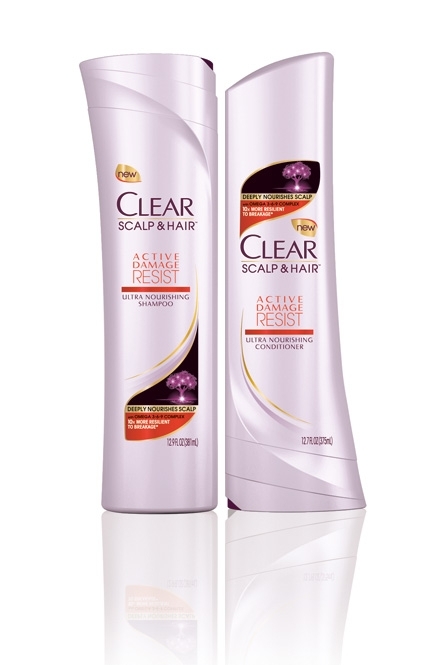 If your hair is feeling more damaged than dry, consider this duo from Clear Scalp & Hair. 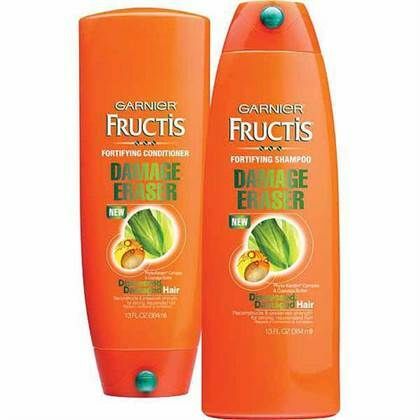 It has a great smell, and helps to strengthen hair to prevent breakage. I immediately noticed a difference after using both of these products. I even felt the conditioner helped get the knots out! 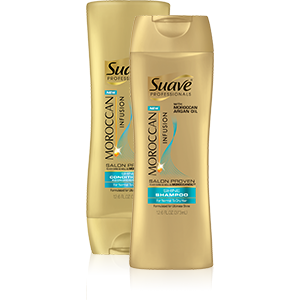 Find both the shampoo and conditioner at your local Target for only $4.99 a bottle. I’m currently in love with ALL the oil sprays from OGX. Although the Coconut Oil and Kukui Oil sprays are my favorites due to their smells. I use these sprays in three different ways: as a detangler replacement before I brush my wet hair; as a heat protector right before I use a curling iron (my curls look great after! ); and as a body lotion replacement. Washing your hair too often is a no go when you’re trying to mend dry/damaged hair. Instead of washing your hair daily, try every other day. That’s where dry shampoo comes into play; and this stuff rocks! I first heard about this product after a reader suggested it on this post (thank you!). It smells great and works just as well as more expensive brands. 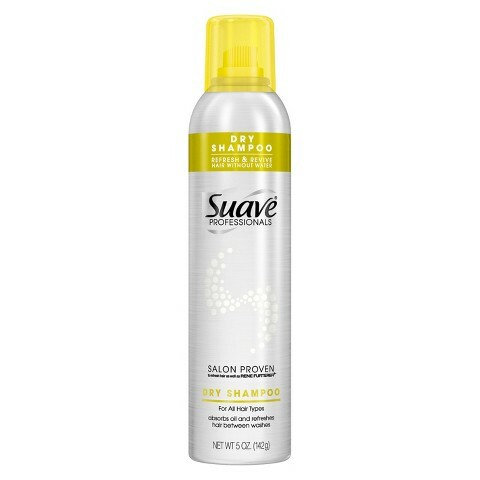 You can find it at Target for under $3, and at drugstores for under $5. Dove’s dry shampoo is a great budget option as well. 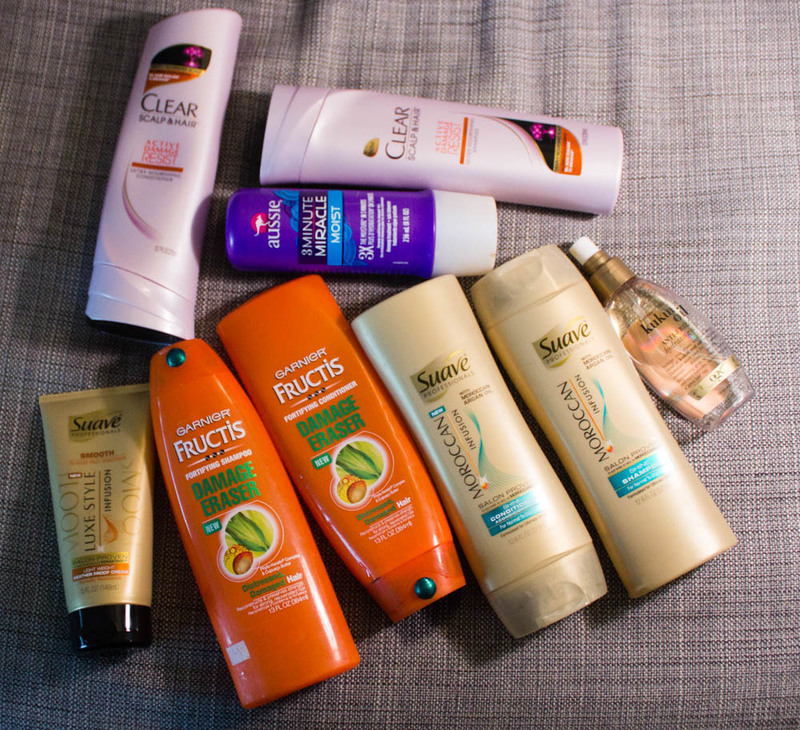 In need of a good (and cheap) conditioner? 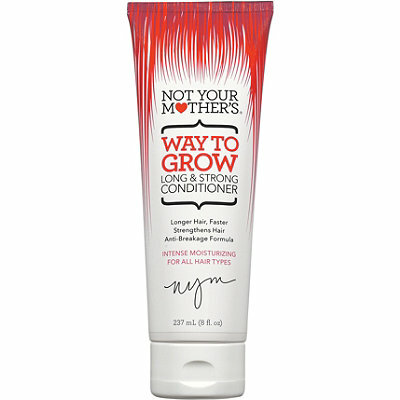 Then you’ll love the Way to Grow Long & Strong Conditioner from Not Your Mother’s. It smells great and will make your hair extremely soft. I highly recommend the 3 Minute Miracle deep conditioner in Moist. It’s not too heavy, so feel free to use it every time you shower. 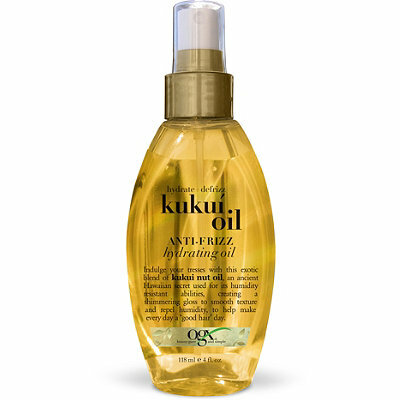 This classic cheapie is perfect if you have dry hair and you’re on an extremely tight budget. You can usually find this duo at drugstores and dollar stores since you most likely won’t be paying more than $1 a bottle. The Strawberries & Cream is my favorite! 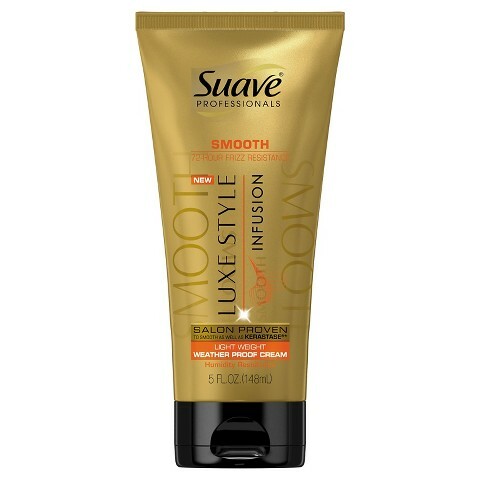 Here’s another great product from Suave Professionals. I apply it as a heat protector before blow drying my hair. It’s light weight and it’ll help cut the frizz. It also adds a great sheen to the hair, which makes it look healthy. Find it for $5.99 at your local drugstore. My former roommate (and good friend) used to have extremely damaged hair. She’s a natural blonde, then she decided to dye her hair dark brown. After a few months as a brunette, she decided to go back to blonde. Unfortunately, her hair wasn’t a fan. At the time, she was on an extremely tight budget and relied on the Full Repair Line from John Freida. A difference was definitely made! She also used the Damage Therapy Line from Dove (which was also helpful). 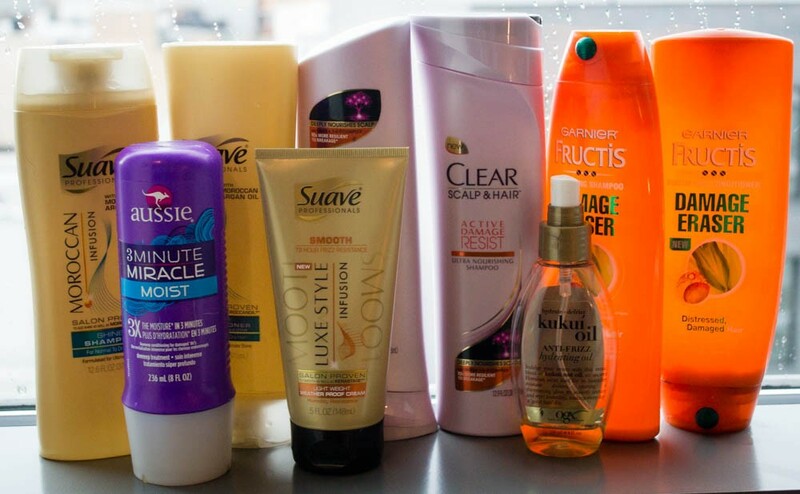 What are your favorite drugstore products? Let us know in the comments below! *I personally used all of these products. Great post! I have coily SUPER DRY hair but it’s also fine and can easily suffer from build-up. 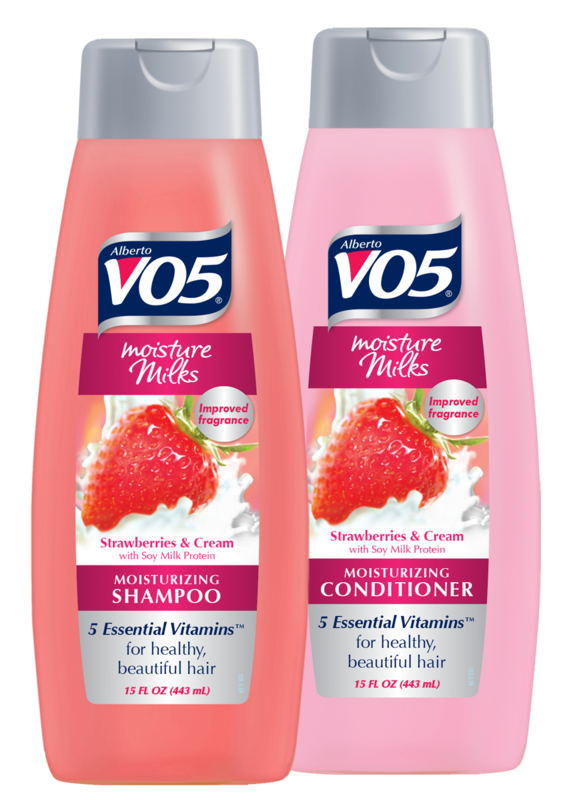 I have tried most of these products and they work great for my hair.